The fourth of six children, Anthony John Spilotro was born and raised in Chicago, Illinois. He attended Burbank Elementary School, and entered Steinmetz High School in 1953. His father Pasquale "Patsy" Spilotro Sr. had emigrated from Triggiano, Province of Bari, Italy, and had arrived at Ellis Island in 1914. When Pasquale arrived in the US, however, he had no money, education, or particular skill. Unlike most Italian immigrants who settled in "The Patch", the Spilotros lived at 2152 North Melvina Avenue. He and his wife Antoinette Spilotro ran Patsy's Restaurant, located at 470 N. Ogden, which was frequented by mobsters such as Salvatore "Sam" Giancana, Jackie "The Lackey" Cerone, Gus Alex, and Francesco "Frank the Enforcer" Nitti. In 1954, Pasquale suffered a fatal aneurysm and died at the age of 55, leaving six sons. Along with four of his brothers, John, Vincent, Victor, and Michael, Tony became involved in criminal activity early in life. The remaining brother, Pasquale Jr., went to college and became a highly respected oral surgeon in the Chicago area. Tony became a made man in 1963, at 25 years old. He was nicknamed "Tony the Ant" by the media after FBI Special Agent William Roemer referred to Spilotro as "that little pissant." Since the media couldn't use "pissant," they shortened it to the "Ant." He was also called "Tough Tony." Spilotro dropped out of Steinmetz High School in his sophomore year and quickly became known for a succession of petty crimes such as shoplifting and purse snatching. His first arrest occurred on January 11, 1955, when he attempted to steal a watch from a River Forest store and was charged with larceny; he was fined $10 and placed on probation. In 1976, Spilotro formed a Las Vegas-based burglary ring with his brother Michael and Herbert "Fat Herbie" Blitzstein, utilizing about eight associates as burglars. The crew became known as the Hole in the Wall Gang because of its penchant for gaining entry by drilling through the exterior walls and ceilings of the buildings they burglarized. The Hole in the Wall Gang operated out of The Gold Rush, Ltd jewelry store. Other gang members included Peter Basile, Frank Cullotta, Joseph Cusumano, Samuel Cusumano, Joseph D'Argento, Ernesto "Ernie" Davino, Leonardo "Leo" Guardino, Frank DeLegge, Michael LaJoy, Ernest Lehnigg, Wayne Matecki, "Crazy Larry" Neumann, Butch Panczko, Peanuts Panczko, Pops Panczko, Salvatore "Sonny" Romano, Gerald Tomasczek, Carl Urbanotti, and former Las Vegas detective Joseph Blasko, who acted as a lookout and who later worked as a bartender at the Crazy Horse Too, a gentleman's club; Blasko died of a heart attack in 2002. Following a botched burglary at Bertha's Household Products on July 4, 1981, Blasko, Cullotta, Davino, Guardino, Matecki, and Neumann were arrested and each charged with burglary, conspiracy to commit burglary, attempted grand larceny, and possession of burglary tools. They were locked into the Las Vegas Police Department's holding cell in downtown Las Vegas. The only members of Spilotro's gang not arrested for the July 4 burglary were Blitzstein, Cusumano, Romano, and Michael Spilotro. By this time, Spilotro's relationship with Frank Rosenthal had severely deteriorated, as Spilotro had had an affair with Rosenthal's wife, Geri McGee. Meanwhile, Cullotta had turned state's witness, testifying against Spilotro. But the testimony was insufficient, and Tony was acquitted. The FBI first "flipped" Charles "Chuckie" Crimaldi, a former associate of Sam DeStefano. Crimaldi had been a "juice collector" for DeStefano during the 1950s and 1960s. He gave evidence against Spilotro and DeStefano in the murder of real estate agent-loanshark Leo Foreman on November 19, 1963; DeStefano and Spilotro were both acquitted. Crimaldi also provided information on his part in murdering another DeStefano loanshark, William "Action" Jackson, to keep him from cutting a deal with the FBI in exchange for a lighter sentence on a hijacking charge. Roemer denied Jackson had cut any deal with the FBI. Many years later, in 1982, Sal Romano, a member of the Hole in the Wall Gang who specialized in disabling alarm systems, became a government informant. He worked counter-surveillance during botched Bertha's Las Vegas burglary in 1981. Unknown to the rest of the Wall Gang, Romano had tipped off federal agents and police, who were waiting for the burglars when they were drilling through the roof at Bertha's. When Spilotro's childhood friend Frank Cullotta was arrested in the attempted Bertha's burglary, the FBI presented him with a wiretap tape that revealed that Spilotro was out to have him murdered. Cullotta agreed to become a federal witness. In court, he admitted that he had done "muscle work" on Spilotro's behalf for many years, including setting up the infamous Chicago 1962 "M&M Murders" of James Miraglia and Billy McCarthy. Spilotro had been ordered by Outfit bosses to track down and kill the two men after they robbed and murdered three people in a suburban Chicago neighborhood territory that was considered off limits since several Outfit members lived there. Cullotta also testified that Spilotro ordered him to murder Las Vegas mob associate Sherwin "Jerry" Lisner in 1979. Las Vegas authorities and the FBI discovered that Spilotro had ordered Larry Neumann to murder Cullotta and Wayne Matecki. Cullotta, who had publicly admitted to being a killer himself, supplied more information about the M&M Murders. Neumann tried to post bail for Cullotta so he could murder both him and Matecki, but the police had Cullotta's bail revoked to protect him. Cullotta received eight years in connection with a previous burglary. In September 1983, Spilotro was indicted in Las Vegas on murder and racketeering charges based on Cullotta's testimony, but the charges didn't hold up. Meanwhile, Spilotro was tried before Cook County Circuit Judge Thomas J. Maloney for the M&M Murders, while Neumann was sentenced to life in prison in 1983. Maloney did not accept Cullotta's statements as evidence or as proof "beyond a reasonable doubt", and then, in turn, acquitted Spilotro. In 1992, Maloney himself would later be convicted through Operation Greylord of accepting bribes in several related and unrelated cases. Cullotta testified before the President's Commission on Organized Crime and the Florida Governor's Commission on Organized Crime, and appeared at a sentencing hearing for Chicago mobster Joseph Lombardo. He later served as a technical advisor for the 1995 Martin Scorsese movie Casino, in which Cullotta also played a small role as "Curly", one of Remo Gaggi's hitmen, who murders Andy Stone, a union boss, in an icy restaurant parking lot, and John Nance, a money courier in his own Costa Rica home. Spilotro and his brother Michael, 41, disappeared June 14, 1986 after meeting with a Criminal Justice Paralegal and protege of mob attorney Sidney Korshak named Jacques Darrow Carr, when they drove away together from Michael's Oak Park home saying they would return in several hours. Their car, a 1986 Lincoln, was recovered several days later in a motel parking lot near O'Hare Airport. On June 22, their bodies were found, one on top of the other and clad only in undershorts, buried under 5 feet of wet earth in a muddy grave within the 12,000-acre Willow Slough preserve, just 2 miles east of the Illinois-Indiana state line. The freshly turned earth had been noticed by a farmer who thought that the remains of a deer killed out of season had been buried there by a poacher, and notified authorities. Their decomposing remains were identified by their brother Pasquale, Jr. and dental X-ray records. An autopsy determined that the brothers had been savagely beaten. In January 1986, in the wake of the imprisonment of Joseph Aiuppa and John Cerone for skimming Las Vegas casino profits, a meeting was held at the Czech Lodge in North Riverside, Illinois. Most of the ‘upper echelon’ were there, including Outfit boss Tony "Joe Batters" Accardo. Accardo had decided to appoint Samuel Carlisi as the "Street Boss" in charge of Outfit operations to replace Aiuppa. Carlisi told the group that Accardo would stay on as consigliere and would have final say, as well as Gus Alex staying head of the connection guys. He then went on to the first problem: Spilotro, and how things had gone down since he took over Vegas. Mobster and mob enforcer Rocco Infelice said, "Hit him." Everyone else at the meeting agreed. It was, at the time, suspected that Spilotro and his brother Michael were called by Carlisi to a meeting at a hunting lodge owned by Aiuppa, Spilotro's former mob boss. Original reports stated the Spilotros were buried alive after the beating, in an Enos, Indiana cornfield. However, in 2007, mob assassin Nicholas Calabrese testified at the "Operation Family Secrets" that the brothers were killed in a Bensenville, Illinois basement where the Spilotros believed Michael would be inducted into The Outfit. According to court testimony, when Tony entered the basement and realized what was about to occur, he asked if he could "say a prayer." It is possible, as the target of the "hit" was Anthony, that Michael was only killed because he was with him, or that the Outfit had decided from the outset that both brothers had to go to prevent any possible future revenge killings. No arrests were made until April 25, 2005, when 14 members of the Chicago Outfit (including reputed boss James Marcello) were indicted for 18 murders, including the Spilotros'. The suspected murderers included capo Albert Tocco from Chicago Heights, Illinois, who was sentenced to 200 years after his wife Betty testified against him in 1989. She claimed that the day after the Spilotro murders, she was called to pick up Tocco 1 mile (1.6 km) from where their bodies would later be found. She said that Tocco was dressed in dirty blue work clothes. Betty Tocco further implicated Nicholas "Nicky" Guzzino, Dominic "Tootsie" Palermo, and Albert "Chic" Roviaro in the murders. Tocco died at the age of 77 in an Indiana prison on September 21, 2005. Another suspect in the murders was Frank "The German" Schweihs, a convicted extortionist and alleged Chicago assassin who was suspected of involvement in several murders including the Spilotros, Allen Dorfman (of the Teamster's Pension Fund), and a former girlfriend. Schweihs was arrested by the FBI on December 22, 2005. At the time, he was a fugitive living in a Berea, Kentucky apartment complex. Schweihs had slipped away before prosecutors were able to arrest him and 13 others, including Marcello. On May 18, 2007, the star witness in the government's case against 14 Chicago mob figures, Nicholas Calabrese, pleaded guilty to taking part in a conspiracy that included 18 murders, including the hits on Anthony and Michael Spilotro. Under heavy security, Calabrese admitted that he took part in planning or carrying out 14 of the murders, including the Spilotro killings. He became the key witness against his brother, Frank Calabrese, Sr., and other major mob figures charged in the government's Family Secrets Trial. Calabrese agreed to testify after the FBI showed him DNA evidence linking him to the murder of fellow hit-man John Fecarotta, who was also allegedly involved in the Spilotro slayings. In September 2007, Frank Calabrese, Sr. and four other men—Marcello, Joseph Lombardo, Paul "The Indian" Schiro, and former Chicago police officer Anthony "Twan" Doyle—were convicted of mob-related crimes. On September 27, 2007, Marcello was found guilty by a federal jury in the murders of both Spilotro brothers. On February 5, 2009, he was sentenced to life in prison for the murders. Spilotro was replaced in Las Vegas by Donald "The Wizard of Odds" Angelini. He is survived by his wife Nancy, his adopted son Vincent, and his remaining brothers. By the time of his death in 1986, the FBI suspected Spilotro was responsible for at least 22 murders. He was indicted in 1983 for his role in the murders of Bill McCarthy and James Miraglia, popularized in the press as the "M&M Murders." McCarthy and Miraglia were two young criminals who had robbed and shot two businessmen and a woman in the mobster-populated neighborhood of Elmwood Park, near Chicago. They were also in debt to Spilotro's old boss, Sam DeStefano. Their bodies were discovered on May 15, 1962, in the trunk of a car dumped on the Southwest Side of Chicago. Both had been beaten badly and had their throats slit. From McCarthy's injuries, it seems his head was placed in a vise, popping out his eye, presumably to persuade him to disclose the whereabouts of Miraglia. The murder of Bill McCarthy (renamed "Tony Dogs") is portrayed in Martin Scorsese's 1995 film Casino. Spilotro would later refer to McCarthy as the toughest man he ever met. Spilotro may have been involved in the attempted car bombing murder of Lefty Rosenthal on October 4, 1982. He was also incriminated in the murder of his onetime mentor "Mad" Sam DeStefano on April 15, 1973, while DeStefano, his brother Mario and Spilotro were all facing trial for the murder of Leo Foreman, a local collector for the mob, who had been tortured to death in Sam DeStefano's basement. Spilotro is further suspected of murdering San Diego real estate heiress Tamara Rand (an event portrayed in the film Casino); Teamsters Union executive Allen Dorfman; and Danny Siefert, the manager of the International Fiber Glass Company. Siefert was to be a principal witness in the fraud case but was shot in front of his wife and four-year-old son in September 1974. The fiberglass company was later burned to the ground by arsonists, whereupon they claimed the insurance money. According to former Willow Springs, Illinois, police chief Michael Corbitt, statements by Outfit Capo Sal Bastone implicated Spilotro in the murder of former Chicago Outfit boss Sam Giancana. The FBI believes Spilotro was also involved in the torture murder of loan shark enforcer William "Action" Jackson, who worked for DeStefano in the 1950s and 1960s. The Chicago Outfit mistakenly believed Jackson had become an FBI informant in 1961. A gang led by Sam DeStefano took Jackson to a meat packing plant, where he was tortured. Jackson was left near death for three days before finally succumbing to his injuries. Allegedly, Spilotro was a member of the gang that tortured and murdered him. Martin Scorsese's film Casino (1995) is based on the Las Vegas careers of Spilotro and Rosenthal, on whom the characters Nicholas "Nicky" Santoro (played by Joe Pesci) and Ace Rothstein (played by Robert De Niro) were based, and Nicky serves as one of the film's main antagonists. In the film's climax, Nicky and his brother Dominick (Philip Suriano), based on Tony's brother Michael Spilotro, are shown being beaten with metal baseball bats and buried alive in an Indiana cornfield by their associate Frank Marino (Frank Vincent), based on Frank Cullotta, and the rest of Nicky's crew. In the 1980s NBC series Crime Story, the character of mobster Ray Luca is based on Anthony Spilotro. ^ Robert Casillo (2006). Gangster priest: the Italian American cinema of Martin Scorsese. University of Toronto Press. pp. 336. ISBN 978-0-8020-9403-2. ^ Roemer, William F., Jr. (1994). The Enforcer- Spilotro: The Chicago Mob's Man Over Las Vegas. The Ballantine Publishing Group. p. 9. ISBN 0-8041-1310-6. ^ "News: Former detective fired for Mafia link dies at 67". reviewjournal.com. Retrieved 2009-10-11. ^ a b "Spilotro, Anthony - The Free Information Society". Freeinfosociety.com. Retrieved 2009-10-11. ^ UNITED STATES v. MALONEY , 94-2779 (United States Court of Appeals, Seventh Circuit. 1995). ^ Roemer, William F., Jr. (1994). The Enforcer- Spilotro: The Chicago Mob's Man Over Las Vegas. The Ballantine Publishing Group. p. 272. ISBN 0-8041-1310-6. ^ Mike Robinson (19 May 2007). 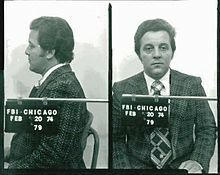 "CHICAGO'S ORGANIZED CRIME FAMILY: Guilty plea entered in Spilotro hits in '86". Las Vegas Review-Journal. Archived from the original on 22 September 2009. Retrieved 22 September 2009. ^ "News: CHICAGO MOB TARGETED: Goodman, family pleased wit". reviewjournal.com. Retrieved 2009-10-11. ^ "Dorfman Associate Indicted". New York Times. January 28, 1983. Retrieved 2010-03-15. ^ Michael J. Corbit (2003), Double Deal: The Inside Story of Murder, Unbridled Corruption, and the Cop who was a Mobster, pages 194-197.